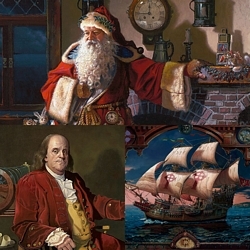 Image Size: 8"w x 20"h.
Here at The Greenwich Workshop, the holiday season doesn’t begin until we unwrap a box from artist Dean Morrissey to reveal the year’s painting of Father Christmas. Over the past ten years we have had the pleasure of publishing Morrissey’s portraits of a very real, wise and generous man that just happens to be Santa Claus. In "Father Christmas: The Workshop," he’s putting in a few hours after dinner, with a couple of industrious elves for companionship and help with the finishing touches. Why not let this picture of a twinkle-eyed craftsman decorate your home for the holidays this year?